Opening the Sky: Qatar: Beige is Beautiful! Anniversary, 2016 in a cove, with sand all around us. Showing my son, Jonathan, a new definition of expansiveness. Taupe, beige, tan, brown, buff or oatmeal colored, all those neutral colors that can blend and blur together are surprisingly beautiful in a desert. In my time of being an expat in Qatar, I have learned to appreciate the desert on another level, and even the occasional bloom in the spring. The sun looms larger here on a flat horizon when there are no vertical slopes to peek over. The ever widening vastness beckons that there are endless possibilities because you see no obstacles or hindrances. Everything is possible in a beige desert, as long as you have your water and occasional shade--just as the wandering nomads of deserts have always known. Blogpost of Celebrating Sand! Steve, who had never painted in the Middle East, was enthralled with how to express his new love of painting more neutral, muted tones. The desert can open up a new level of creativity. Is it the boundlessness of the borders, the opening of a new world, seeing with new eyes? Perhaps it is the shedding of former thoughts/traditions that the sand has blown away? This picture hangs in my living room. It is not finished here, but I love the sunrise, with the hint of rainclouds in it. For many Qataris, a tent or a compound of tents is how they live during the winter months here. 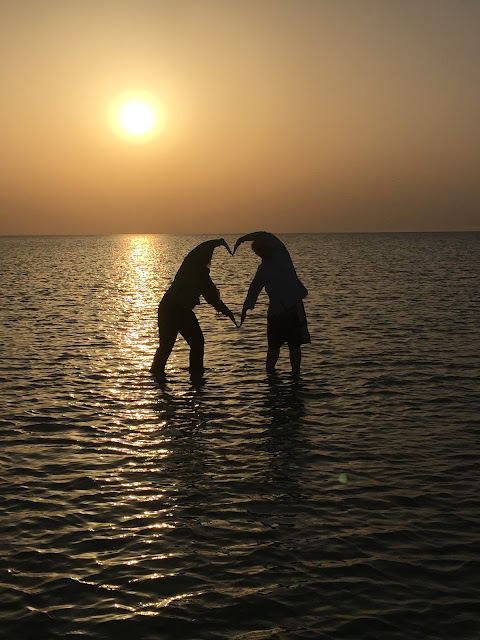 If you go out to the shorelines around Qatar, there are many people who spend the more temperate winter months by the beach. I love this picture that Steve painted of a tent in a windstorm. The stakes appear that they are anchored in the shifting sand, even in the billowing wind. Check out Megan Hansen's Video of "Off the Road." meganjhansen.blogspot.com Megan captures the sublime serenity of the beautiful, beige desert. "I Want Our House to Smell like Art!"